Japan has loved textiles throughout the ages, using their texture and beautiful colors to adorn their living spaces and clothing. Traditionally, a wide range of textiles was created nationwide, but Kyoto's Nishijin-ori [Nishijin brocade] has gained fame as Japan's most representative artistic fabric. This luxurious, elegant brocade, whose patterns seem to rise like a relief, requires the mastery of skills and a long time to weave by hand. 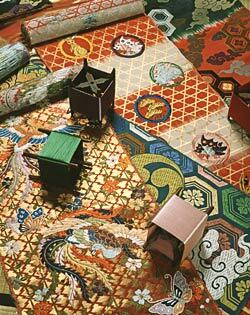 Kimono, obi (kimono sash) and drop curtains made of Nishijin-ori have been extremely expensive. However, mechanization and computerization in recent years has made it possible to create products at relatively inexpensive prices. All over Japan, innovations are being made not only in Nishijin-ori, but also in weaving and knitting technologies for other fabrics. Can conventional weaving machines and everyday computer systems be used together to weave beautiful designs? A textile manufacturer in Yonezawa, Yamagata Prefecture, which has been involved for a long time in the production of traditional Yonezawa-ori fabric, developed a computer program with this idea in mind. The program enables the conversion of digital photographic data to program data that controls the weaving machine. This method, named PHOTOTEX, was revolutionary in the way that it enabled fabric to be woven as easily as just making a printout from a computer. Prior to this, designs could be printed in ink on fabric, but with photographic weaving, superfine threads of various colors are woven together to replicate the image. With as many as eight different colored threads, a vivid design in any color or tone can be woven. The result is a fabric that mirrors the photograph perfectly. Not only can this system recreate traditional designs, but it can also create unique items by using the image data from personal photographs and valuable cultural assets. 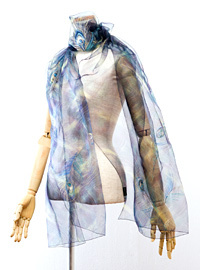 World's Lightest and Thinnest Fashion Textile If photographic weaving was an attempt to use the power of technology to create detailed designs, the Super-Organza developed by a textile manufacturer in Nanao, Ishikawa Prefecture is a fabric created in the pursuit of using technology to achieve the ultimate in lightness and thinness. Super-Organza emerged from a commission that this manufacturer received to develop a super-thin electromagnetic shield for plasma televisions. To make this shield, the developer introduced seven-denier (denier is a unit of the fineness of yarns) ultra-fine polyester yarns. This size was much finer than the 20-denier threads that had been the normal standard for ultra-fine yarns. It is equivalent to one-fifth of the fineness of human hair and is almost impossible to be seen by the human eye. The manufacturer realized that if this fine yarn could be used to weave textiles for clothing, they would be able to produce a fabric thinner and lighter than anything ever seen before. This inspiration sent him on a two-and-a-half year pursuit of techniques in the microtechnology world that could be adopted before he finally completed a special weaving machine. The fabric produced by this new machine achieved a weight of only 10 grams per square meter, and now the company has achieved 5 grams—so thin and light that it looks as though it can float in the air. Subsequently, Super-Organza is being used in the haute couture of Paris and for the costumes of ballerinas dancing at the Opéra national de Paris, gaining worldwide attention. Innovations in the Knitting FieldJapanese technology has also accomplished amazing feats with knitting machines. Previously, knitwear had been made by cutting up knit cloth—woven with a flat surface—into the body, sleeves and other parts of clothing and then stitching them together to make the final product. However, with this traditional method, the fabric left over after cutting the parts goes to waste, and the seams impair the comfort of the wearer. A revolutionary knitting machine devised to redress these shortcomings was developed by a manufacturer in Wakayama Prefecture. 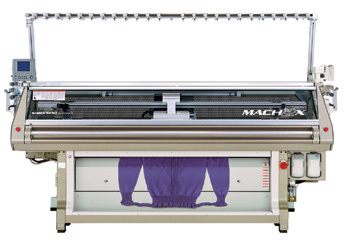 This machine knits three-dimensional fabric to create a completed product in one stroke. Since there are no seams needed to stitch the parts together, the feel of the clothing is particularly comfortable, and the fabric's elasticity was also improved. 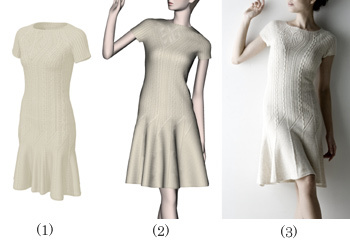 Products could be knit to mirror a design as wished, expanding design options significantly. The product is made with the optimal amount of yarn, and it is also easy to produce in small lots, opening up new possibilities for on-demand and order-made production. These examples are just some of the ways that Japan's advanced technical skills are creating weaving and knitting methods that were previously impossible. Products made through these innovative technologies will continue to attract attention worldwide.